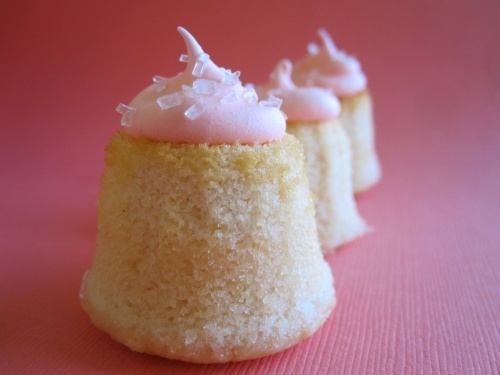 I got the idea for these cupcakes when perusing for hi-hat recipes. Someone had chosen to give them a Valentine’s Day makeover with a pink themed cherry vanilla twist. I paired the cupcake from that with a meringue icing recipe from the Food Network (throwing in a measure of cherry here too) to make this little pink treat. I wanted to sample a different style of icing than the traditional butter cream I love, and if you too are looking for something with a unique flavor and texture, meringue may be for you. It’s shiny, fluffy, and light as air. It lacks the sugar kick and serves as a more refreshing option which is great paired with a fruit flavor or garnish. The batter was a light shade of pink and in mini form they couldn’t get more adorable. You’ll soon notice that occasionally when I’m not content with the way the cupcakes look when they come out of the oven—either I don’t like the sleeves I used or they come out a little uneven—I will simply peel the paper off and flip them upside down. It gives them a fun, unique look and makes minis even harder to resist when there is one less step between you and them. Note: If I were to make these cupcakes again, I would do things differently and want you to know what I thought. I loved the cake flavor—it was fluffy, smooth, and uniquely flavorful. A definite favorite! I would pair it with a more standard butter cream type icing (vanilla or cherry) because this icing overpowered the cake and I couldn’t even tell what it tasted like when it was altogether. The icing might be better paired with a lemon or vanilla cupcake. I will give you the recipe for both here, and you may mix and match as you please. Preheat oven to 350 degrees F and place liners in two cupcake pans. Whisk flour, baking powder and salt together in a bowl and set aside. In another bowl, cream the butter and sugar together until fluffy, about 3 minutes. Add flour mixture and milk alternating a bit at a time, starting and ending with the dry mixture. Bring a few inches of water to a boil in a pot that can hold a mixing bowl above the water. Whisk the egg whites, sugar, cherry extract/syrup, cream of tartar and salt in the bowl by hand. Set the bowl above the boiling water and continue whisking until the mixture is hot to the touch and the sugar dissolves, about 1 to 2 minutes. Transfer the mixture to a standing mixer fitted with the whisk attachment and beat at medium-high speed until meringue is cool and holds a soft peak, about 5 minutes. Add a few drops of food coloring and continue beating until it holds stiff peaks. Next Next post: grapefruit, greatfruit?